Click here to see the pictures of these beautiful banners. Cascades Casino, Coast Hotel and Convention Centre: 10 banners. Beautification and anti graffiti accomplished at the same time! In partnership with BC Hydro and the City of Langley, seventeen Hydro and traffic boxes were wrapped throughout the downtown. This is just another example of how by working together we can accomplish more than we ever could alone. Click here to see the before and after pictures! 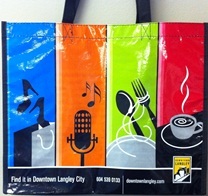 The Downtown Langley Business Association launched their new “Get Fresh” Program in May 2012. This program was created to provide the Business Improvement Association businesses an opportunity to take advantage of matching grants that are specifically designed to improve the overall appearance of their businesses. “This is an opportunity for businesses to make those positive changes that they may have been thinking about for a while”, says BIA Executive Director Teri James. “We have seen many improvements over the years as a result of this grant funding”. Exterior Painting Grant – This applies to the exterior painting of any store front business in the BIA, and the DLBA will match the total cost, dollar for dollar, to a maximum of $1,000. Awning and Signage Cleaning Grant – the DLBA has hired a professional awning/signage cleaning company that has already supplied the office with the cleaning cost for each awning and sign in our BIA, and the DLBA will pay for half the cost. Façade Improvement Grant –the DLBA will pay for half the cost of awning replacement or re-skinning, windows, doors or a complete face-lift. This grant matches dollar for dollar to a maximum of $1,000. For the Awning Cleaning Grant, a simple phone call to the office will get the ball rolling. The Exterior Painting and Façade Improvement grants require approval from the BIA Grant Review Committee prior to commencement of work. Businesses can select one or all of the grant opportunities at full value, and letters of intent for façade improvement and exterior painting are accepted on a first-come-first-served basis. Click here to view brochure and before & after pictures! To help you get a head start, the Downtown Langley Business Association and Northwest Waste Solutions offering a special opportunity to local merchants. The DLBA has recently designed and ordered awesome “go to” bags and we’d like to offer them to you at the low cost of $2.00 each. These bags are colorful, durable, and functional and are guaranteed to catch the attention of everyone who sees them.